I came across this book in the Lit Hub Daily newsletter and didn’t bother reading the Lit Hub article but ordered a copy of the book because I like Goya and I liked the idea of a graphic novel biography of an artist I like. I don’t read a lot of graphic novels but I don’t pooh-pooh them either since most have as much text as a typical poetry collection and the artwork can be spectacular. This book was okay. I thought Fran Galán did a beautiful job illustrating, but the story didn’t do much for me. El Torres’s story of Goya’s later years is inspired by the artist’s biography. Some of Goya’s most interesting work is the stuff he did as he descended further into mental illness. El Torres focuses on the descent, but not so much the art that resulted. I felt like that was a bit of a miss, considering the format is so image dependent. I skipped the Vancouver Sun Run again this year and instead went for a leisurely jog along about 87 per cent of the BMO Marathon route. I rode the Skytrain to 41st street and basically ran the race course, minus the first bit and last bit and the out-and-back around 14KM. I’m going to over-analyze this run until the actual race (and probably beyond). I’ve had mixed feelings about it all day. I posted it to Strava as “demoralizing” and it definitely was over the last 8 or 9 KM as I completely gassed out in the flats around the Stanley Park Seawall. But there were some positives, too. I thought that the dreaded Camosun hill wasn’t as bad as the hype. 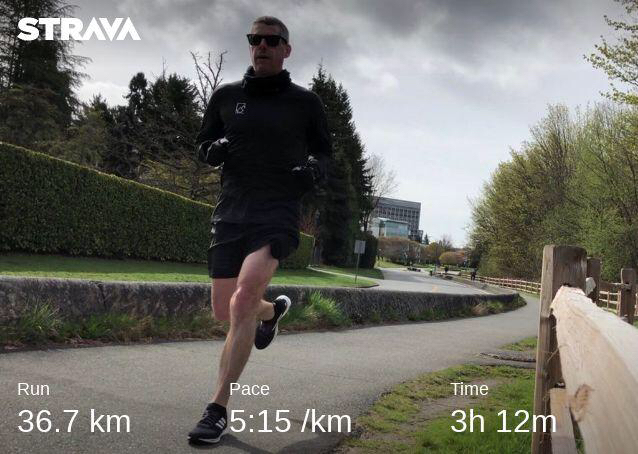 Granted I wasn’t running race pace, but I thought a couple of the hills at last weekend’s April Fools Run half marathon on the Sunshine Coast were harder. The other positive was that my breathing and heart rate were both pretty casual over the whole 192 minutes, which I think it a great sign. Unfortunately, my legs do not have the same fitness as my heart and lungs. It’s hard not to second guess the process right now. I’m trying not to. But I’m concerned that my overall fitness just isn’t where it should be with just three weeks to go until the marathon.